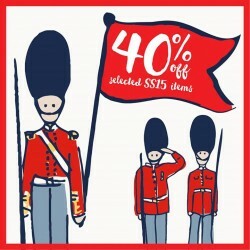 The sale at Cath Kidston just got even better! Enjoy 60% off ALL sale items in Cath Kidston stores now, available while stocks last! 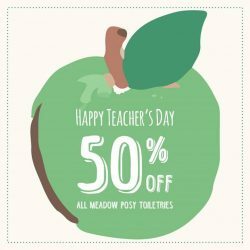 Last call for our Teachers' Day promotion! Pop by our Cath Kidston stores and find the perfect treat for the special person who presented you with the gift of knowledge. Valid till 2 September 2016. Other terms and conditions apply. Enquire in-store for more details. Valid from 15 Aug – 2 Sep 2016 or while stocks last. Other terms and conditions apply. Enquire in-store for more details. Check out the image for more details. Terms and conditions apply. We want you to have fun at #CathKidstonSG at all times! 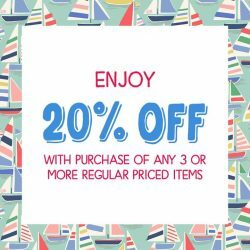 If you haven't heard, here's a little treat from us to keep you in good spirits - enjoy 20% off with purchase of any 3 or more regular priced items. Enquire in-store for more details. Terms and conditions apply. Nothing beats a good deal to start the week afresh. Shop for 3 or more of your coveted modern vintage items and enjoy a whopping 20% off! Share this sweet treat with your fellow shopaholics today. Valid from 4 - 31 July 2016 and only on regular priced items. Here's a great Monday surprise for you! 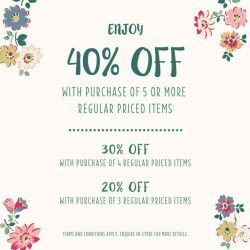 Save while you shop for modern vintage items with #CathKidstonSG. Our special treat to kick off the #GreatSingaporeSale #GSS! Valid from 30 May - 3 July 2016. Applicable only on regular priced items. Enquire in-store for more details. Here's their March Mug specials! 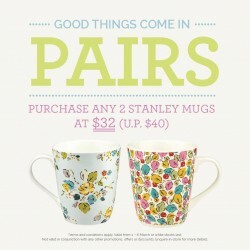 Get any 2 Stanley Mugs at a steal from 1 - 6 March or while stocks last. Other terms and conditions apply. 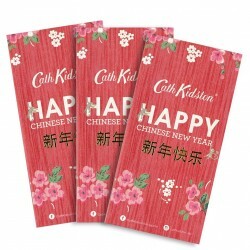 If you haven't heard, ‪Cath Kidston‬ is rewarding you with their exclusive Monkey print red packets when you shop with them. 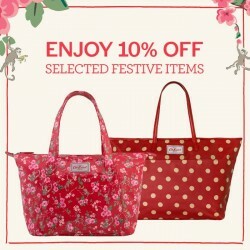 And enjoy 10% off selected festive items that they recommend for this Chinese New Year! Terms and conditions apply. Valid till 9 February or while stocks last. Enquire in-store for more details. 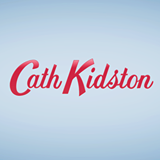 Enjoy and receive tokens of love from CathKidston. Get Mini handcreams when you spend $160 nett or more, purchases over $220 nett receive a multi card wallet. Terms and conditions apply. Valid from 1 - 14 February or while stocks last. Inquire in-store for more details. Look good and ready this Chinese New Year with ‪Cath Kidston with their cheery bright bags! Enjoy 10% off selected festive items and spring surprises when you go for house-hopping. Terms and conditions apply. While stocks last. Enquire in-store for more details. Enjoy and celebrate the first Monday of the year with no blues at CathKidston and get up to 60% OFF all your favourites. Terms and conditions apply. While stocks last. Enquire in-store for more details. Christmas is just round the corner and they're here to help with your Christmas shopping frenzy! 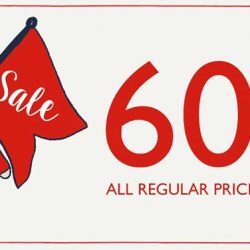 Enjoy up 60% off selected SALE items at Cath Kidston where you can find loads of lovely gift ideas from their variety of Bags, Fashion, Accessories, Home and Kids items at any budget for anyone. 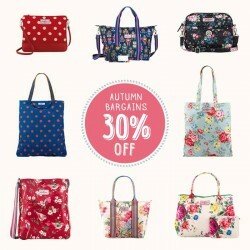 The best of the Bags are up to 30% off in their Autumn Bargains! Swing by #CathKidstonSG today to check out the selected bags to take home at a bargain. Terms and conditions apply. Enquire in-store for more details. While stocks last. 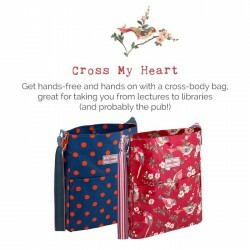 Grab Cath Kidston offers their Quirky printed bags with ample room for your laptop, A4 folders, and even chargers for your IT gadgets. Even better, and get up to 15% OFF these bags for a limited time only. In this picture: Button Spot Cross Body Bagand British Birds Cross Body Bag. Now retailing at $102 each (U.P. $120). Terms and conditions apply. While stocks last. Sale items are non-exchangeable and non-returnable. Enjoy Cath Kidston's Button Spot Embossed Handbag Tote and save up to 15% OFF, retailing at $181.90 (U.P. $214). An elegant handbag for daily use that comes with a detachable Zip Purse in a matching embossed fabric. This is your perfect all-in-one bag to fit your day-to-day essentials. To sweeten the deal. Terms and conditions apply. While stocks last. Sale items are non-exchangeable and non-returnable. 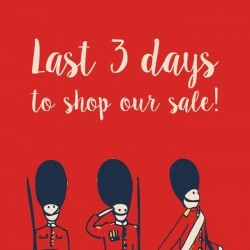 Final call to our fellow Cath Kidston lovers. 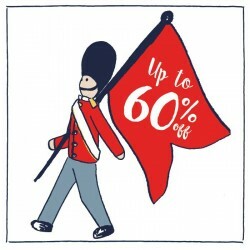 Enjoy up to 60% OFF selected items at the following Cath Kidston stores. From now till 30 September, do swing by and bag home your coveted modern vintage items. See you there. 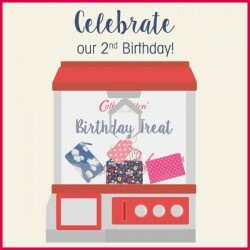 Join their celebration at CathKidstonSG's 2nd Birthday and Spend a minimum of $130 nett and stand a chance to receive a Key Fob or Zip Purse when you have a go on their Cath Kidston Claw Machine. Valid till 30 Sep, while stocks last. Terms and conditions apply. Enquire in-store for more information. There’s no better way to show your appreciation for your teachers during Teachers' Day on 4 September than to surprise them with this pair of delightful CathKidstonSG Flora Mini Handcream. Get these 2 at only $18 (usual price $16 each)! Terms and conditions apply. While stocks last. Enquire in-store for more details. There’s no better way to show your appreciation for your teachers on this special occasion than to surprise them with this pair of delightful #CathKidstonSG Flora Mini Handcream. Get these 2 at only $18 today (usual price $16 each). Terms and conditions apply. While stocks last. Enquire in-store for more details. The weekend is almost here! 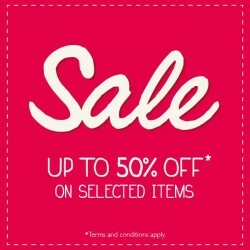 Visit your nearest Cath Kidston store to shop at a bargain with attractive discounts of up to 50% off on selected items! See you there! Terms and conditions apply. Available in 3 bright hues and premium quilted finish! 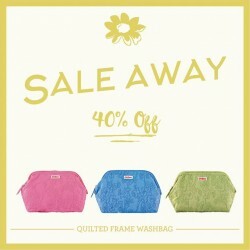 This Quilted Frame Washbags make a gorgeous gift for a friend (or just keep it for yourself). Pack it full with make-up or bathtime necessities for travel or spontaneous weekend getaways! Now retailing at $37.80 each (usual price $63) @ Cath Kidston. Top picks are going at 40% off! Visit Cath Kidston to shop your favourite modern vintage items today! Terms and conditions apply, while stocks last. 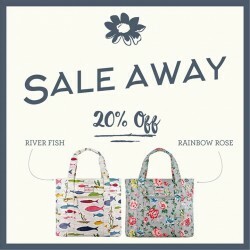 Hurry, get a large open carry all bag in either the River Fish or Rainbow Rose prints! 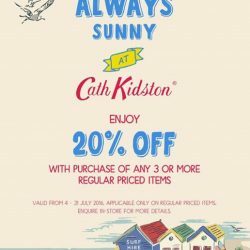 For only 20% off @ Cath Kidston. Ideal for a sleepover, carrying folders, transporting laptops or filling with the weekly shopping! Now on sale at $63.20 (usual price: $79). Terms and conditions apply, while stocks last. Because we are all entitled to feel fresh and smell good all day, we've got a selection of fresh and fragrant toiletries which come in beautiful floral packaging that makes gifting presentable and fuss free! Choose this ultimate bath collection at only S$38.50 (usual S$55), while stocks last!